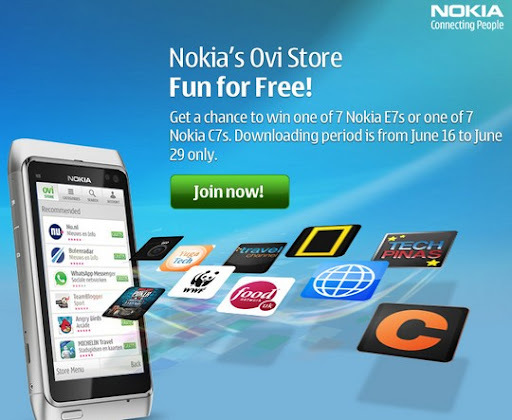 Win Nokia E7 and Nokia C7 : Simply by Downloading an Ovi Store App! 2. It's always nice to join a raffle where you can a chance to win a Nokia smartphone. Nokia Philippines is giving away seven Nokia E7 and seven Nokia C7 units via Ovi Store - Fun for Free Promo. This contest is open to all registered Nokia Ovi Store users and interested non-registered consumers. Non-registered consumers though must go to Ovi Store first and register using his or her email address to get an Ovi account. Once registered, Ovi Store users must log on to the promo website and submit his Ovi username, first name, last name, address, mobile number, and email address that he used to register his Ovi account to officially qualify for the raffle promotion. After completing all registration requirements, he can download as many apps, themes and games. Every download is equivalent to one raffle entry. Make sure you read the complete mechanics HERE. Downloading period is from June 16 to June 29, 2011. So we still have 3 days to download as many apps as we can! Join now!